Idaho is home to many mountain ranges and plains for the avid hiker and climber. People who are into the outdoors love to come here and get away from densely populated areas, and to reconnect with nature. Idaho is also known as the potato state because one third of potatoes are produced here. Needless to say, Idaho is an important agricultural state, as a lot of wheat is grown here as well. Lumber and silver are other important resources from this state. 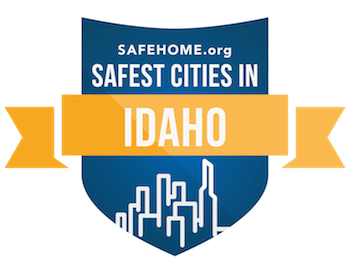 Despite being an expansive state with a low population density, Idaho is still home to 6 of the top 500 safest cities in the nation. Idaho has 1.6 million residents, but its vast expanse makes the population density only 20 people per square mile. This means there are a lot of small towns, with a few large ones clustered around the state’s major industries. The state capital Boise is the largest city in the state, with an impressively high safety score of 78.57, despite having a large population of 218,844. Densely populated cities tend to experience higher crime, but that is not the case here. The safest cities in Idaho all have safety scores in the upper 80s and 90s. Weiser is one of those smaller cities, with a high safety rating of 96.67! It has a population of 5,321 and is located by the border to Oregon, northwest of Boise. This city is very safe as it is mostly a farming community, where people are busy with their livestock and orchards, and are self-sufficient. Most of the safest cities in other states are safe because those cities have high median income levels, signaling that no one is driven to crime out of desperation. The median income here though, is $31,996 for a family. However, residents here have plenty of land and can get by just fine with what they have. The state overall has a very low crime rate, with nearly all of the 25 safest cities in the state experiencing a drop in violent and property related crimes from their already low rates. As mentioned above, Boise is the most densely populated city and yet still has a high safety rating. The combination of farming and religious communities creates a safe environment throughout the state. The lowest rated city in terms of safety was Chubbuck, with a safety rating of 71.12. Compare that to other states where their 25th safest city drops as low as the 20s. From a statistical standpoint for safety, you really can’t go wrong in Idaho!